But what’s this? Riding a cow and armed with a book rather than a sword, a fourth mystery knight dares to enter the dragon’s den. But who can it be? Plucky Princess Daisy of course! This edition comes with a free audio reading featuring music and using children’s voices – accessible anywhere and anytime you’re connected to the internet by scanning a QR code on your smartphone or tablet. 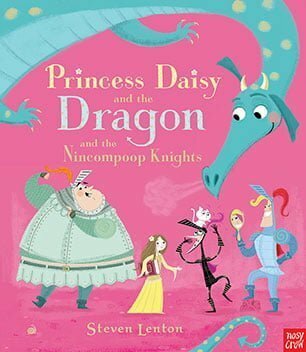 Steven Lenton hails from Cheshire where he spent many a school holiday working in the family Pom-pom Factory, packing poms and designing new products. This somewhat fluffy start to his career did no harm though as since leaving the factory he gained a BA and MA in Animation and has become a successful animator and art director within the realms of children's television. Steven also designs greetings cards and prints, selling them online and in various boutiques (shops) and Fayres (Fairs) around the country. 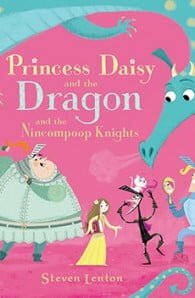 Steven's main ambition has always to be a children's book maker and he is very proud to be realising this dream with Nosy Crow. We like to describe his style as charming, contemporary yet warm, with a gentle humour. Steven likes to describe himself as charming, contemporary yet warm, with a gentle humour.